Many adult diseases develop from complex health and psychosocial pathways that have their origins in childhood. To help address the gaps in the evidence on the antecedents of adult disease, a comprehensive new physical and biomarkers module - the Child Health CheckPoint - is being added to the Longitudinal Study of Australian Children (LSAC) in 2014-15. Linking LSAC's rich existing early-life data with a suite of state-of-the-art measures not previously feasible in large-scale studies will allow researchers to explore early-life mechanisms underlying health gradients of the children now and the adults they will become. This article outlines Child Health CheckPoint's history and progress to mid-2014, at which time the module is in advanced planning. The right of every child to enjoy the highest attainable standards of health is enshrined in the United Nations Convention on the Rights of the Child (United Nations, 1989). Although the last century has seen remarkable gains, children's physical health remains of considerable concern to parents and to policy-makers. Chronic health conditions experienced during childhood are rising. In 2004, 7% of US children were reported by parents as having a limitation of activity due to a chronic condition lasting for three months or more, compared to just 2% in 1960 (Perrin, Bloom, & Gortmaker, 2007; National Centre for Health Statistics, 2006). Social disparities in health are widening, links between physical and psychological wellbeing are becoming more evident, and their biologic bases more clearly delineated. Of equal importance, the asymptomatic precursors of adult disease (such as obesity, inactivity, poor oral health, high blood pressure, and low lung function) are evident by late childhood. Important challenges for population health care systems are to understand the overall impact of health conditions on children's life experiences, and thus to improve outcomes through prevention and appropriate, effective intervention at the earliest possible stage. In response to these needs, a major physical health and biomarkers module - the Child Health CheckPoint - is being planned for the Longitudinal Study of Australian Children (LSAC), supported by researchers and key policy agencies and linked to national child health indicators and frameworks. LSAC (also known as Growing Up in Australia) is Australia's largest and only nationally representative children's longitudinal study (Nicholson & Sanson, 2003; Sanson, Johnstone, the LSAC Research Consortium, & the FaCS LSAC Project Team, 2004). Designed in 2002 to examine the impact of Australia's unique social, economic and cultural environment on the next generation, it has aimed from the outset "to provide a strong evidence base for policy development and service delivery on a wide range of issues relating to children's development" (Sanson et al., 2004, p. 46). Since 2004, LSAC has conducted five biennial waves; Wave 6 (B cohort age 10-11, K cohort age 14-15) is in the field throughout 2014, and Wave 7 (ages 12-13 and 16-17, respectively) is currently in design. Conceptually, LSAC is rooted in the socio-ecological model of child development (Bronfenbrenner & Morris, 1998). Therefore, it has collected information about many aspects of children's development (physical and mental health, social adjustment, cognitive development, and school achievement) and children's experiences at home, in childcare, school and local communities, along with socio-economic and other contextual information (Sanson et al., 2002). The hallmark of longitudinal studies is their dexterity in fulfilling multiple purposes. For LSAC, this means that new and repeated measures are judiciously mixed at each wave to study risk and protective factors, developmental trajectories and pathways, stability and change over time, and transition points. LSAC has a number of design features that make it an invaluable research resource. It is a public dataset and data are accessible to all researchers, avoiding the common scenario of studies that generate few or no publications (Nicholson & Rempel, 2004). Core measures (such as mental health, health-related quality of life and special health care needs) are widely used internationally, and will potentially support cross-country and health economics studies of how culture and policy impact on health and other outcomes. LSAC is linked with existing national datasets, including lifetime Medicare usage (both the Medicare and Pharmaceutical Benefits Schedules), immunisation, and national literacy and numeracy assessments, and moves are under way to support a wide range of geographically based analyses. These add multiple axes along which data can be combined to address new and creative questions. Thus, LSAC is already highly productive with, at time of writing, over 400 licenced users and nearly 300 peer-reviewed publications. The Child Health CheckPoint was conceived as a mechanism to enhance LSAC's capacity to explore the major health issues confronting Australia's children, to better understand the relative health and economic burdens of different conditions; relationships between multiple problems and how they contribute to the total burden of disease; and the complex pathways between social circumstance, risk/protective factors, disease and health. Parents already report substantial health information in every wave of LSAC (see Table 1). Repeated, standardised measures include parent reports on: child global health; health-related quality of life; special health care needs; disability, injuries and hospitalisations; and information on a wide range of specific health exposures, problems and outcomes (Wake, Sanson et al., 2008). These data span 25 of the 39 Australian Key National Indicators of child health, including 12 of the 19 Headline Indicators for monitoring health within subpopulations and jurisdictions (Australian Institute of Health and Welfare [AIHW], 2008). Notes: BIA = bio-electrical impedance; SDQ = Strengths & Difficulties Questionnaire; PBS = Pharmaceutical Benefit Scheme; HRQL= Health Related Quality of Life. a Birth weight and length, current weight. b Breastfeeding, solids. c Infant temperament. d Brief Infant Toddler Social Emotional Assessment. However, direct physical measurement in Waves 1-6 has been largely limited to children's height, weight, waist girth and (in some waves) body composition and blood pressure using simple portable equipment; no biomarkers (biological samples) have been collected. This limits LSAC's capacity to address questions relating not only to the impact of earlier exposures on health, but also to the impact of health on all subsequent outcomes. These limitations have been acknowledged since inception (Nicholson & Rempel, 2004). an estimate of the costs of various options. Many large-scale children's longitudinal studies collect physical and biomarker data at every wave. However, this is extremely expensive, and would significantly depart from the study to which parents originally consented. Therefore, we conceptualised a single cross-sectional data collection module through which the children's complex longitudinal trajectories would run (see Figure 1). This would provide outcomes of early family, psychosocial, educational and health predictors with six waves of longitudinal LSAC data spanning the first decade of post-natal life; its longitudinal power could begin to be realised almost immediately. The measures would also act as predictors of subsequent psychosocial, educational, physical and economic participation outcomes through to late adolescence, while minimising respondent burden in terms of both time and discomfort. It would also support cross-sectional and longitudinal mapping of many of the Australian child health Key National Indicators and Headline Indicators (AIHW, 2008) to their underlying, directly-measured physical morbidity and, with the inclusion of health economic measures, to health burden and cost. their inclusion would offer new insights into causal and outcomes relationships between physical, social and emotional wellbeing. A founding principle of LSAC is that a new data release is made available every two years, approximately 9 months after the end of each major wave of data collection. This open access encourages researchers to develop topical new hypotheses, drawing on LSAC's multiple dimensions. Therefore, the goal in designing the module was less to propose specific hypotheses than to provide multiple cutting-edge measurements on which researchers could test multiple novel hypotheses. Next, we describe the key health domains recommended for inclusion in the Child Health CheckPoint and provide examples of possible broad research topics that could be addressed. Note that, at time of writing, further funding is still being sought to make all of these possible for all children. The dominant chronic childhood respiratory problem, asthma, affects 15% of all children, and declining lung function in adulthood imposes a substantial population burden. Examples of research topics include: (a) the impacts of cumulative lifetime asthma symptoms on lung function; and (b) relative roles of social gradients, smoke exposure and atopy in lung function. Bone mass accrues throughout childhood, with most adult bone mass laid down by age 17. Sun exposure contributes to bone mass via vitamin D synthesis, but also causes skin cancer. Examples of research topics include: (a) the genetic, social, health and environmental predictors of peri-pubertal bone characteristics; and (b) relationships between skin phenotype, vitamin D and bone characteristics. LSAC is in a prime position to study the early development of these two pressing health issues. Examples of research topics include: (a) the impact of early growth trajectories; and (b) the impact of cumulative physical activity and nutritional profiles on peri-pubertal (around the onset of puberty, generally 11-13 years of age) cardiovascular and metabolic risk factors. The retina is the only window into the microvasculature (the small vessels in the circulatory system), quantifying the impact of cardiovascular risk. Visual impairment costs Australia $10 billion per year (Taylor, Pezzullo, & Keeffe, 2006), with early refractive errors (e.g., short-sightedness and long-sightedness) contributing substantially. Possible research topics include: (a) life-course predictors of peri-pubertal microvascular changes; and (b) genetic and environmental risk factors for myopia (short-sightedness). Healthy child nutrition is a policy priority of all Australian governments. Understanding how nutrition relates to health and disease across the life course would be of immense policy significance. Possible research topics include the relationship of cumulative "healthful" and "unhealthful" diets with: (a) peri-pubertal nutritional status; and (b) health outcomes. Around 25% of school children are now overweight or obese, increasing their risk of many serious health conditions. Possible research topics include: (a) early life determinants (including social and environmental) of obesity and its comorbidities; and (b) its current natural history. Dental decay is the most common chronic disease of childhood (Benjamin, 2010), and recent improvements appear to be reversing. Oral health may predict general health throughout the life course. Possible research topics include: (a) the prevalence of poor oral health, and (b) its associations with social gradients and physical measures (e.g., bone characteristics, microvasculature changes). Physical activity benefits physical and mental health, and low physical activity predicts metabolic syndrome and cardiovascular risk, independently of obesity and other lifestyle elements. Possible research topics include: (a) early life determinants of fitness and physical activity; and (b) associations between strength, physical activity and fitness and (i) bone characteristics, and (ii) microvascular changes. As one of life's most dramatic transitions, puberty has major ramifications not only while adolescents are negotiating its shoals but also for an individual's long-term social, mental and physical health. Possible research topics include: (a) the extent of changes in emotions and behaviour during puberty; and (b) the relationships between early life determinants, age of pubertal onset and emotional and behavioural difficulties. Affecting one in seven adults, chronic kidney disease is increasing and costs of end-stage kidney disease in Australia between 2009 and 2020 are estimated to reach $12 billion (Kidney Health Australia, 2006). Seven per cent of Australian children have proteinuria (too much protein in their urine), an early marker of microvascular disease. Research topics include associations between proteinuria and: (a) cardiovascular profiles; and (b) body composition, fitness and muscle strength. Socio-economic gradients in health may be established very early in childhood, and chronic stress may be one underlying component of their psycho-biological pathways (Kelly, Hertzman, & Daniels, 1997). Possible research topics include the prediction of chronic stress by: (a) cumulative psychosocial and socio-economic gradients; and (b) physical health (e.g., physical activity, body composition and cardiovascular risk). Sleep duration has slightly but steadily decreased over the last 100 years. Sleep problems at age 6-7 years affected around 25% of LSAC children and were associated with sizeable decrements in health-related quality of life and behaviour, and higher rates of injury and ADHD. Sleep is also implicated in obesity. Possible research topics include relationships of sleep duration/fragmentation with: (a) body composition; and (b) stress biomarkers. Biomarkers can provide information about cardiovascular risk profiles, stress, growth and puberty, inflammation and environmental exposures. Most of the example research topics above, can be explored using both physical health measurements and biomarkers. For many years, the collection of biological specimens has been considered for LSAC, but has been constrained by cost, feasibility, time and acceptability within the 90-minute biennial home visit that is the cornerstone of LSAC. Since LSAC's inception, however, processing methods have improved, collection, analysis and storage costs have come down, and other large-scale studies have demonstrated that taking such samples for long-term storage and use are indeed acceptable to the great majority of parents and children and can be conducted within an accepted ethical framework. Thus, the new module plans to introduce a number of biosamples, of which the core is a stored blood sample for biochemical, genetic and epigenetic analyses (see "Methods" below). Following consultation with other international studies such as the Dutch Generation R (Jaddoe et al., 2010), a number of other readily-obtainable samples (e.g., urine, saliva) are also under consideration. The scoping report also recommended including a child public health economist from the outset. This would enhance LSAC's capacity to explore socio-economic policy issues using both the existing LSAC dataset (including health service resource use from birth) and the new physical health and biomarkers module. Ideally, the module would measure child health-related quality of life using a self-report multi-attribute utility instrument that weights responses to dimensions such as vision, pain and physical mobility by the relative importance (preference weight or utility) of each attribute to the public, allowing a meaningful summation of scores. These values can then be used to calculate quality-adjusted life years (QALYs) for epidemiologic modelling; for example, of longer-term consequences of problems and in burden of disease studies. Possible research topics include: income gradients in child health measured by the new physical health measures, compared to LSAC's existing parent-reported measures; relationships of health service use with physical health measures and biomarkers, again compared to existing parent-reported measures; and relationships between physical health and biomarkers and health-related quality of life. It would be expensive, so it could not be absorbed into the ongoing funding apportioned to the existing LSAC study. The technical nature of the measurements to the desired quality would require expensive, delicate items of equipment most suited to an assessment centre, rather than the usual home visit characteristic of LSAC. Additional high-level health and biomarkers expertise would be needed over and above that available within LSAC's existing scientific advisory group. Storage of bio-specimens and creation of a digital repository for the physical measurements would require facilities and systems not available within the existing LSAC structure. Ultimately, these needs were met via assembling a new partnership involving a subset of the researchers already involved in LSAC, representatives of LSAC's senior management, and child health researchers new to LSAC with content expertise in the relevant aspects of children's physical health and biomarkers. Led from the Murdoch Childrens Research Institute (MCRI) in partnership with the University of South Australia, University of Adelaide and Deakin University, this group submitted a funding application to the Australian National Health and Medical Research Council (NHMRC) in early 2012. Late that year, a $3.1 million project grant was awarded for the period 2013-17, with data collection commencing in late 2014 and continuing throughout 2015 between LSAC's main Waves 6 and 7. This funding comprises the backbone of the forthcoming child physical health and biomarkers module - dubbed the Child Health CheckPoint - with additional funding now being sought to expand the measures and include a parallel, simultaneous measurement suite for the attending parent. Taking a life-course perspective, LSAC's physical and biomarkers module, the Child Health CheckPoint, is in advanced planning at the time of writing. Victorian data collection commences in late 2014 and continues into early 2015. The centre-based module will then travel around Australia through the remainder of 2015, between LSAC's biennial Waves 6 and 7. The target sample comprises all B cohort children at age 11-12 years (anticipating contacting around 4,000 children, or 80% of the original cohort). The Child Health CheckPoint is focusing on the B cohort because: (a) it has detailed pregnancy and birth data; (b) the six data collections span the children's entire postnatal lives; (c) by this age, there is a wide range in normal values and risk factors strongly predicting adult preclinical markers of disease (Magnussen et al., 2012); and (d) experience tells us the health measurements in the Child Health CheckPoint will be of greater interest (and so attract higher uptake) to children and parents at this age than to the 15-16 year olds in LSAC's older K cohort. the digital and biospecimen repositories are in advanced planning, to be housed securely at the MCRI and available to all researchers via an access policy. The Child Health CheckPoint expects to be approached by both Australian and international researchers with requests to access some de-identified data within these repositories to conduct very specialised research. Policies for granting such access are being developed, based on the stringent access policies in place in other large-scale longitudinal studies. To minimise variability and costs, we are planning to use the same protocol, equipment and reagents in a single "pop-up" testing centre that travels sequentially to each capital city and Australia's five largest regional centres. All equipment and procedures are transportable and have been tested in field conditions. Each of the staff will be trained in several of the tasks that comprise the full protocol. Children will be invited (in groups of up to 10) to attend a morning or afternoon 3.5 hour assessment with their primary caregiver, usually their mother. There is no requirement to fast before the session. The flow is designed to allow: (a) a single set of the most expensive equipment (such as those required to measure bone characteristics and microvascular changes); (b) resting measures (cardiovascular, spirometry) to precede bloods; (c) blood sampling follows, at least two hours' fast, but precedes exercise; (d) height measurement precedes body composition, which requires height for its algorithms; (e) staff can assist children with the specific demands of each task; and (f) our technicians can undertake preliminary bio-specimen processing in the centre. Staff will provide a brief printed summary report on measures with clinical utility of value to participants, modelled on that of the UK Biobank (a project started in 2006 that has undertaken similar health measures in 500,000 people aged between 40-69 years). They are likely to be acceptable, and of interest, to virtually all families and children. The physical measures are brief, non-invasive, feasible, robust and reliable. Children do not need to fast overnight or disrobe - they can be assessed in light clothing. Collectively, they provide a sophisticated, integrated snapshot of children's health phenotypes, and key putative biological and behavioural risk factors. This module represents what we believe currently offers the best balance compatible with an integrated understanding of children's developing health phenotypes (as both outcomes and future predictors), participant interest and retention, cost and feasibility. Each area is overseen by an investigator recognised for their clinical and research expertise in this area. Children will proceed through a series of assessments as summarised in Box 1. It is also anticipated that the attending parent will be invited to undertake a subset of the same measures. numerous biological samples, including blood. The module's exact measures and extent are still being finalised as the project team completes advanced piloting and explores avenues for additional funding and support. The definitive range of measures will be the subject of a future, more detailed published protocol. We will follow international recommendations for children in cohort studies (Brisson, Matsui, Rieder, & Fraser, 2012) including: (a) collecting biospecimens at the same time as other measures; (b) consistency in personnel, processing equipment and consumables; (c) monitoring of lag time; (d) small sample volume; and (e) a secure data audit trail. With privacy paramount, 2-D barcode labelling will be used for all samples. The biospecimens will undergo immediate processing at the collection centres by a limited number of trained LSAC field staff, before being transferred to the Murdoch Childrens Research Institute's Bioresource Centre. Single batches of reagents/consumables will be used at all centres and will be tested prior to Child Health CheckPoint's commencement as per international standards (Peakman & Elliott, 2008). Standard quality measures (such as cell viability after thawing) will be tested on a random subset of samples from each centre early in the collection period. Standard data items: As they are derived, health and bio-specimen datapoints will enter the LSAC public dataset to be used indefinitely by all researchers, with no further cost or sample deterioration. Further analyses that do not deplete specimens: These will be undertaken on a user-pays basis, then enter the LSAC dataset after a specified period of use. Further analyses that do deplete specimens: To carefully husband the finite bio-specimens, a Data Access & Use Committee will set principles by 2016 (before the first public data release in late 2017) to govern researcher-driven access, ethics requirements and use. The best predictor of research informing policy development is the early and ongoing involvement of decision-makers in its conceptualisation and conduct (Sipthorp & Misson, 2009). LSAC is jointly conducted by the Australian Department of Social Services, the Australian Institute of Family Studies and the Australian Bureau of Statistics. The Consortium Advisory Group (CAG), chaired by Child Health CheckPoint Associate Investigator Steve Zubrick and including CheckPoint Chief Investigators Melissa Wake and Michael Sawyer, is a multidisciplinary team of researchers who largely drive the science of the project (Sanson et al., 2002). 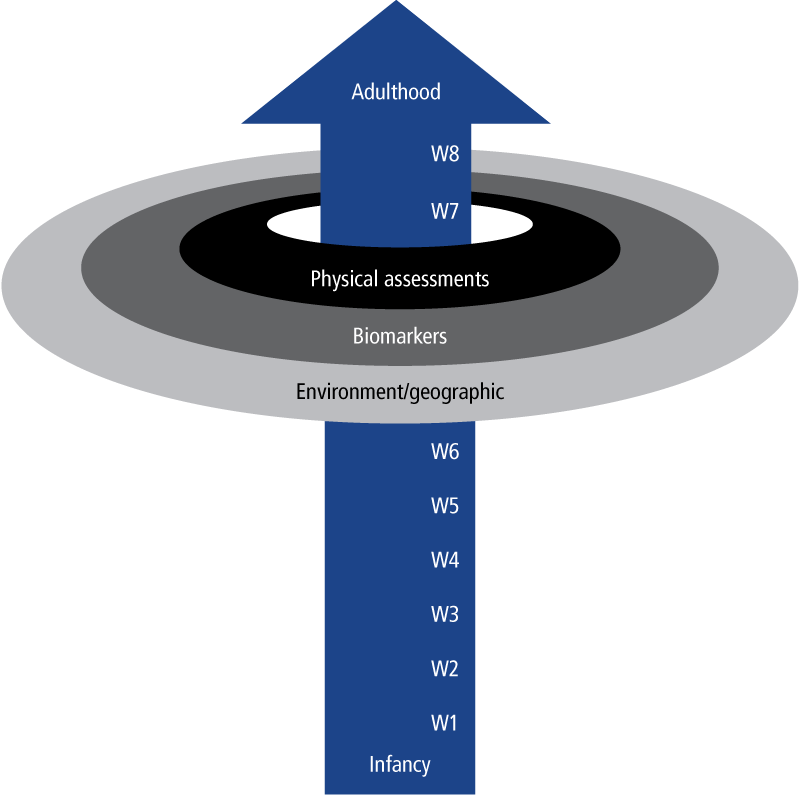 This structure underpins the management of and content input into the Child Health CheckPoint as it does the main Longitudinal Study of Australian Children, and provides opportunities for knowledge and information exchange as the Child Health CheckPoint moves forward and results become available. The Steering Committee is chaired by Professor Wake and includes all Child Health CheckPoint investigators and partners. Internal subcommittees are led by Child Health CheckPoint investigators and oversee key activities as follows: (a) Operations (chaired by Dr Susan Clifford with Professor Wake); (b) Data Management & Statistics (Professor John Carlin); (c) Bio-specimens (Associate Professor Richard Saffery); and (d) Data Access & Use (Professor Zubrick). Communication with the larger LSAC team occurs at the consortium meetings attended three times per year by the full LSAC partnership and chaired by Professor Zubrick. This enduring collaboration has successfully met demanding, time-locked schedules since 2004. A Child Health CheckPoint study deed between the Commonwealth and the MCRI governs matters relating to integration of the Child Health CheckPoint with the Longitudinal Study of Australian Children. The Child Health CheckPoint is a timely, low-risk and high-yield addition to an already powerful national study that is of increasing international significance. Its innovation is to efficiently integrate cutting-edge measures of late-childhood physiology with lifetime trajectories of mental and physical health, growth, behaviour and healthcare into a single population study. Over the coming decades, its strong conceptual framework will inform analyses to better understand how these trajectories interact with social circumstances to impact both on children's quality of life and the physiological and structural changes that precede disease. By late 2017, and within two years of completing data collection, Australia will boast an outstanding digital and biosamples resource for all researchers to better understand how early life affects health. Its benefits can only grow with time, as ongoing waves of the main LSAC study accrue into adulthood, as new dimensions enter LSAC (e.g., a proposed geospatial module), and as new variables are mined from the Child Health CheckPoint's rich repositories. Thus, over coming decades this latest addition to Growing Up in Australia should bring to the Australian policy table highly significant new knowledge about inter-connected social and health childhood pathways to leading causes of morbidity and death. Australian Institute of Health & Welfare. (2008). Key national indicators of children's health, development and wellbeing (Bulletin No. 58). Canberra: AIHW. Benjamin, R. M. (2010). Oral health: The silent epidemic. Public Health Reports, 125(2), 158-159. Brisson, A. R., Matsui, D., Rieder, M. J., & Fraser, D. D. (2012). Translational research in pediatrics: Tissue sampling and biobanking. Pediatrics, 129(1), 153-162. Bronfenbrenner, U., & Morris, P. A. (2006). The bioecological model of human development. In R. M. Lerner, & W. Damon (Eds. ), Handbook of child psychology: Volume I. Theoretical models of human development (5th Ed. ; pp. 793-828). Hoboken, NJ: John Wiley & Sons. Jaddoe, V. W., van Duijn, C. M., van der Heijden, A. J., Mackenbach, J. P., Moll, H. A., Steegers, E. A. et al. (2010). The Generation R Study: Design and cohort update 2010. European Journal of Epidemiology, 25, 823-841. Kelly, S., Hertzman, C., & Daniels, M. (1997). Searching for the biological pathways between stress and health. Annual Review of Public Health, 18, 437-462. Kidney Health Australia. (2006). The economic impact of end-stage kidney disease in Australia: Projections to 2020. Melbourne: Kidney Health Australia. Magnussen, C. G., Niinikoski, H., Juonala, M., Kivimaki, M., Ronnemaa, T., Viikari, J. S. et al. (2012). When and how to start prevention of atherosclerosis? Lessons from the Cardiovascular Risk in the Young Finns Study and the Special Turku Coronary Risk Factor Intervention Project. Pediatric Nephrology, 27(9), 1441-1452. National Center for Health Statistics. (2006). Health, United States, 2006: With chartbook on trends in the health of Americans. Hyattsville, MD: National Center for Health Statistics. Nicholson, J. M., & Rempel, L. A. (2004). Australian and New Zealand birth cohort studies: Breadth, quality and contributions. Journal of Paediatrics & Child Health, 40(3), 87-95. Nicholson, J. M., & Sanson, A. (2003). A new longitudinal study of the health and wellbeing of Australian children: How will it help? Medical Journal of Australia, 178(6), 282-284. Peakman, T. C., & Elliott, P. (2008). The UK Biobank sample handling and storage validation studies. International Journal of Epidemiology, 37(Suppl. 1), i2-i6. Perrin, J. M., Bloom, S. R., & Gortmaker, S. L. (2007). The increase of childhood chronic conditions in the United States. JAMA, 297(24), 2755-2759. Sanson, A., Johnstone, R., The LSAC Research Consortium & The FaCS LSAC Project Team. (2004). Growing Up in Australia takes its first steps. Family Matters, 67, 46-53. Sanson, A., Nicholson, J., Ungerer, J., Zubrick, S., Wilson, K., Ainley, J. et al. (2002). Introducing the Longitudinal Study of Australian Children (LSAC Discussion Paper No. 1). Melbourne: Australian Institute of Family Studies. Sipthorp, M., & Misson, S. (2009). Wave 3 weighting and non-response (Technical Paper No. 6). Melbourne: Australian Institute of Family Studies. Taylor, H. R., Pezzullo, M. L., & Keeffe, J. E. (2006). The economic impact and cost of visual impairment in Australia. The British Journal of Ophthalmology, 90(3), 272-275. Wake, M., Canterford, L., Nicholson, J., Sanson, A., Bencic, L., Bittman, M. et al. (2008). Options for physical and biomarker augmentation in LSAC: Discussion paper. Unpublished report prepared for the Australian Institute of Family Studies, Melbourne. Wake, M., Sanson, A., Berthelsen, D., Hardy, P., Misson, S., Smith, K. et al. (2008). How well are Australian infants and children aged 4 to 5 doing? (Social Policy Research Paper No. 36.) Canberra: Department of Families, Housing, Community Services and Indigenous Affairs. United Nations. (1989). Convention on the Rights of the Child. Geneva: United Nations. Professor Melissa Wake, Dr Susan Clifford, Dr Fiona Mensah and Professor David Burgner all work at the Murdoch Childrens Research Institute, and the Department of Paediatrics at the University of Melbourne. Melissa Wake and Fiona Mensah also work at the Royal Children's Hospital, Parkville. David Burgner also works at Monash Children's Hospital, Clayton. Sarah Davies works at the Murdoch Childrens Research Institute and Associate Professor Lisa Gold works at Deakin Health Economics, Deakin University. The Child Health CheckPoint includes the following investigators: Prof. Melissa Wake (MBChB, MD), Dr Peter Azzopardi (MBBS, MEpi), Prof. Louise Baur (MBBS, PhD), Prof. David Burgner (MBChB, PhD), Prof. John Carlin (PhD, AStat), Assoc. Prof. Michael Cheung (MBChB, MD), Dr Graham Crist (MArch, PhD), Prof. Terry Dwyer (MBBS, MD), Dr Ben Edwards (BA (Hons), PhD), Assoc. Prof. Lisa Gold (MA, MSc, PhD), Dr Fiona Mensah (MSc (Statistics), PhD), Prof. Tim Olds (PhD (Sydney), PhD (UNSW)), Assoc. Prof. Sarath Ranganathan (MBChB, PhD), Dr Helen Rogers (MEdPsych, PhD), Dr Peter Simm (MBBS, PhD), Assoc. Prof. Richard Saffery (BSc(Hons), PhD), Prof. Michael Sawyer (MBBS, PhD), Mr Luke Stevens (BSc(Hons), Physics), Prof. Tien Wong (MBBS, PhD), Prof. Steve Zubrick (MSc, MA, PhD). Disclaimers and acknowledgements: This paper was written in partnership with the Australian Department of Social Services (DSS) and the Australian Institute of Family Studies (AIFS). Nonetheless, the views reported are those of the authors and should not be attributed to DSS or AIFS. Funding: The Child Health CheckPoint is funded by the Australian National Health and Medical Research Council (NHMRC) Project Grant 1041352, supplemented by the Murdoch Childrens Research Institute, Royal Children's Hospital Foundation, Foundation for Children (Grant 2014-005) and Victorian Deaf Education Institute. Research at the Murdoch Childrens Research Institute is supported by the Victorian Government's Operational Infrastructure Support Program. The NHMRC supports Prof. Wake (Senior Research Fellowship 1046518), Prof. Burgner (Senior Research Fellowship), Dr Mensah (Early Career Fellowship 1037449) and Assoc. Prof. Gold (Early Career Fellowship 1035100). Wake, M., Clifford, S. York, E., Mensah, F., Gold, L., Burgner, D., & Davies, S. (2014). Introducing Growing Up in Australia's Child Health CheckPoint: A physical and biomarkers module for the Longitudinal Study of Australian Children. Family Matters, 95, 15-23.